Elevator boots handmade in Italy with upper in dark brown full grain leather with a "western style" design, country and dynamic. 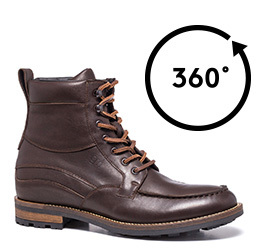 Leather inner lining to keep your feet warm in the city or in the mountains, without loosing comfort. Laces in real leather, rubber outsole 100% natural of the latest generation. Elevator system to be choosen between 2.4, 2.7 or 3.1 inches.